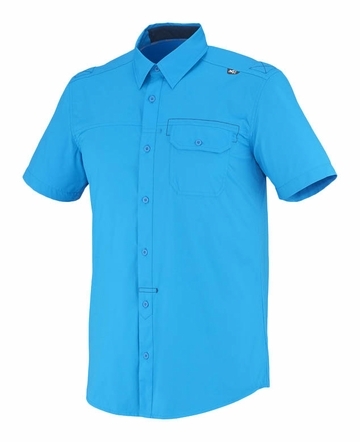 "New this summer, this techy short-sleeve shirt is designed for the outdoor enthusiast and built for exceptional and worldwide adventures. The Backcountry II short-sleeve shirt offers great comfort for alpine and urban activities. The Drynamic Ripstop Stretch is resistant, breathable and moisture wicking. An anti UV treatment provides additional sun rays protection. The shoulders are reinforced to add protection at this area particularly vulnerable to wear from pack straps and friction. The Regular Fit prioritizes comfort for unrestricted movement and a quick access chest pocket allows to stow small items, making the Backcountry II ideal to wear on alpine treks, hiking sessions and travel adventures. - Comfort in action and maximum freedom of movement."